Like the capo and slide, the Jellifish is a mechanical tool for your stringed instrument. (Although the Jellifish was originally designed with the guitar in mind, we have many bass, mandolin and banjo players among our customers.) To make this new tool easy-to-use, we designed the Jellifish to be held like a guitar pick...and, honestly, that's where the similarities end. 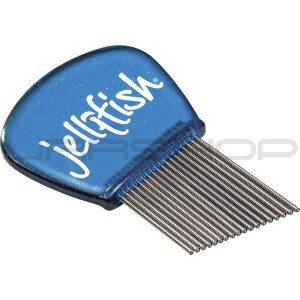 The Jellifish itself isn't a guitar pick, nor does it replace your existing picks. Rather, as one of our astute customers recently said, "It's like a $10 stomp-box!"